Fun & Inspiration 10 Signs She Doesn’t Love You Anymore! 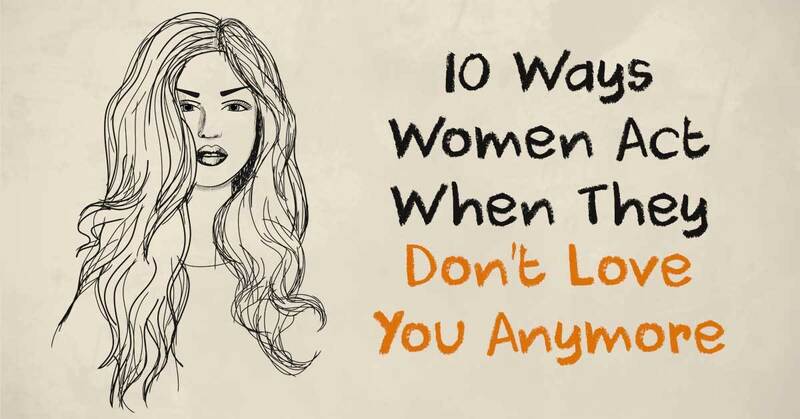 10 Signs She Doesn’t Love You Anymore! A relationship is rarely perfect. Most people won’t even see their relationship flourish because of their mistakes. We, as humans are bound to make mistakes. We are all inherently imperfect. All our mistakes play a huge role in the relationship. In time, they even destroy it. But, there are also cases where people simply fall out of love over the years. In order for your relationship to last, you have to be committed, hardworking, and dedicate a lot of time and effort into it. But, sometimes, luck is the most important thing you will need. Remember, love is sometimes not enough to make the relationship strong and enduring. That is why it is crucial to know if your loved one is falling out of love. Here is how you can spot the signs early. It is important that both of you communicate. But, if she never cares to talk to you, have meaningful and deep conversations with you, it means that she has most likely lost interest. In fact, whenever you try to talk to her, she shuts you down. This is a clear sign you shouldn’t ignore. In the past, she always wanted attention. Whatever you did, she would always want to snuggle, kiss, and hug. But, for some reason, she no longer needs that attention. In fact, she is not even paying attention to you. Well, this probably means that you no longer are the center of her universe. Now, she doesn’t even acknowledge your existence. Why? Well, she doesn’t love you anymore the same way she used to. Getting intimate, hugging, and kissing, are now a thing of the past. The moment this starts happening, this is a clear sign that she has fallen out of love with you. Now that her affection is slowly disappearing, she will start vanishing. She will always find something fun to do without you being there. In other words, you are no longer needed to make her happy. This means that she lost interest in you as a partner. Whenever you used to buy her flowers and gifts, she was extremely excited and happy. But, now, she doesn’t even care if you invite her for a date. Whenever you came home from work, she always greeted you with a smile. But, this smile is long gone now. Now, she doesn’t even recognize you. In the past, she always used to tell you how handsome you are. But, in time, these compliments started to fade. Now, she isn’t even attracted to you. This is a clear sign that she has fallen out of love. She used to do romantic and sweet things for you to express the love she felt. But, things have changed. She doesn’t bother doing anything for you that could make you feel special. Obviously, she is not happy with the way things are now. In fact, she probably doesn’t love you anymore. Are you the only one who makes an effort to talk? If that is the case, then you should be worried. If she still loves you, she will be willing to start a conversation with you. Otherwise, she will keep her thoughts and opinions hidden. The moment she stops putting an effort to fix the relationship, she has given up on you. She thinks that your love is slowly withering, fading, and dying. That is why the two of you keep fighting day and night. Once you become irrelevant to her, she will start acting on her own. Plus, she won’t care how you feel and will end up hurting you. The reason why she does this is because she doesn’t love you anymore.